You have gifts. God has a call. In our children’s and youth ministries, we are privileged to know that it is both! Our volunteers find that in sharing their gifts with the young people of St. Martin’s they too are enriched. Join us in serving, and experience these rich rewards for yourself. Our children and youth will be blessed by all you have to share. Leaders, greeter, and guides work together to ensure children and youth are welcomed warmly and engaged in lessons, activities, and discussions. be happy to see them and share your faith. Help with planning, costumes, rehearsals, and extra hands to shepherd children during performance. Help plan and coordinate Easter Egg Hunt and Petting Zoo. Assist the Children’s choir with helping hands when children perform. Help provide our young people with engaging activities for congregational events like Reformation, Pentecost, and Rally Day. Attend summer camp with children and/or youth to provide a loving presence and build relationships in their time away from home. Join us at Cross Trails camps for a weekend of Lutheran and Bible learning in October and/or January. Share your faith story and build relationships with our confirmands. Help provide our high school youth with service and fellowship opportunities that keep you young and show them how to live in faith. Join high schoolers and volunteers for an exciting week of service and/or fellowship in the summer. Help raise money to provide children’s and youth ministries with new opportunities for faith exploration. These big picture people ensure that the Christian Education of our children, youth, families, and adults is engaging and enriching. Help staff and volunteers implement education opportunities. 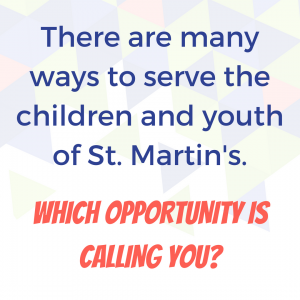 Welcome to St. Martin’s children’s and youth ministries! STEP One – Complete the “Volunteer Info form” on this page. STEP Two – Click here to complete your background check authorization. This must be renewed yearly as per St. Martin’s Volunteer Policy. STEP THREE – Complete any training assigned via email and check out this list of available videos. Please reference St. Martin’s Child & Youth Program Policy and Transportation Policy as needed. Which group(s) would you like to be involved in?